If you’re new to the Bialetti Moka Express moka pot then you no doubt are second guessing the idea of “only’ rinsing the pot in hot water after each use. Coffee oils build up int he moka pot that you can’t help but wonder if you should scrub it down every few days or so. I bought mine about a week ago and have used it a couple times a day and already it’s looking kind of gross. The thing is that it’s really only looking gross because I’m not used to not scrubbing something clean after each use. The Moka pot is an item that actually performs better with that film in place. It’s a complete paradigm shift that must take place to let it be. If you have a Bialetti Moka pot then you have an aluminum pot as opposed to a stainless steel pot. Aluminum can’t be placed in the dishwasher or used with abrasive cleaning pads and it can impart a small metallic taste into liquids (coffee) that sit in it. When you brew a few cups in your Moka pot potent oils bond to the aluminum and form a tight barrier between your liquid coffee and the aluminum walls. So long as you rinse the excess oils and coffee from the pot after each use and allow to air dry the film will remain and will not go rancid or mold. It will even add to the positive flavors of your coffee or “moka espresso”. This would be classified as a well seasoned moka pot. It’s true that if you leave standing residue in the pot and then seal it by reassembling the pot and then not pick it up again for a long time you might be faced with some molding or rancid coffee residue but this is not a problem when you rinse immediately and let air dry. If you do find yourself with growing muck, mold, or spoiled coffee oils then you will have to clean the pot with a vinegar/water mixture, baking soda, or some sort of mild dish soap but this should be a last resort. Long story short – after brewing a pot of coffee in your Bialetti Moka pot wait for your pot to cool down then discard the grind in your trash or compost, rinse the parts thoroughly under running hot water, and ensure that the rubber gasket has been rinsed completely free of grind. Everything should then be left to air dry. You should not reassemble the pot if it’s wet as this can lead to stagnant moist air which is the cause of rancid oils and mold. If you care to clean the outside of your pot remember that you are dealing with aluminum. Usually soaking the pot in extremely hot water and then wiping down with a paper towel is enough to keep the aluminum exterior looking decent. Sure you could use a metal polishing agent or buffering tool but in most cases that is just overkill. Wash all the parts in warm water. This will help ensure that all parts are clean and any chemicals, oils used during manufacturing are removed. Use the moka express 2-3 times and throw away the initial brew. Be careful when you use the handle. Avoid putting pressure when you are unscrewing. This may cause the handle to break. Allow the unit to cool before you separate the top section from the base. Wash in warm water and dry completely. Avoid using strong detergent when washing the aluminum parts. This can taint the aluminum and affect the taste of the coffee. But if you are using the stainless steel models using a mild detergent is possible. You can even apply a liquid chrome polish to keep the stainless steel looking shiny as new. Do not use steel wools or abrasive cleaning materials. This can cause discoloration and damage the surface of your moka express. Coffee residue can build up in the columns of the top part of the pot. 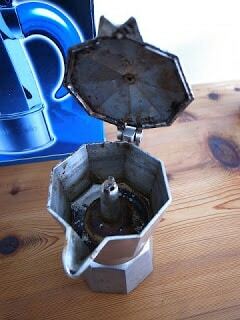 Check the moka pot from time to time and remove any residue. This will help keep your coffee fresh and aromatic. Make sure that all parts are dry before reassembling. Oxidation can occur and rust will eat up the surfaces and inner parts of your moka pot. Bialetti Moka Express should not be put in the dishwasher. Sometimes, you might need to use the moka pot in succession. Maybe you are entertaining guests at home. It may be difficult to unscrew the base because the heat expanded the metal. Tip and trick: A simple trick you can do is to run the entire pot under cold water. When cooled, you can unscrew the base and prepare for the next use. If you want to keep your moka pot in tiptop shape, you need to check parts regularly and replace funnel, filter plate, and ring for wear and tear. This will keep your moka pot running in good condition for years. Due to frequent use and natural oxidation, white residue can build up inside the base. What is the best way to clean it? Tip and trick: Mix warm water and white vinegar. Use a dish brush and clean the bottom using the mixture. The Bialetti Moka Express stands out with five key features: design, ease of use, brew control ability, portability, and price. Design – The moka pot has a sleek and elegant design that’s perfect for modern kitchen. It’s beautiful and functional. Ease of use – It is easy to setup and brewing can be done in just 5 minutes. You can make a good cup of espresso for one or nine. Brew control ability – You can manage the type of brew with ease, whether you need an espresso or a regular brew. Portability – It’s easy to assemble, easy to store. It will not eat up storage space even if you have a small kitchen. Price – Many Bialetti owners have 3 to 4 types of moka pots, in varying size. That’s how affordable the Bialetti line is. According to Home Grounds, users observe two common setbacks of the Bialetti Moka Express. Not dishwasher friendly – Since we live a fast-paced life, having kitchen equipment that can be cleaned ASAP is a blessing. But the Bialetti moka pot needs to be washed by hand. You may need to allot some cleaning time after using it. Not fully compatible with electric stovetop – It needs direct flame to get the right temperature to heat up the moka pot. If you are keen on getting a moka pot for induction stove, you can check out the Bialetti Venus. It takes a few experimentation to get the right coffee taste – To ensure a better tasting coffee, make sure to use coffee ground specifically for moka pots. Coarse ground is better than fine ground. Other expert moka pot users get their own grinder so they can grind beans as per use to keep it always fresh. Use filtered water to get better coffee brew. Never use the moka pot for other contents like tea and cocoa. Never use the moka pot without water or just half water measure. Useful measures to achieve optimum performance.